Amazingly, last night I had the most memorable dream of my life and the best part is that I remember all of it in detail. I was at Scorsese’s house and talking to the man himself about the cinema in India and the deteriorating state of old regional films. How about that?! Dr. Freud would immediately remind me that I had finished reading Scorsese on Scorsese just the day before. Whatever the case is, reading Scorsese on Scorsese is best approximated as an extended conversation with the director. In fact, editors David Thompson and Ian Christie have done a splendid job by keeping factual autobiographical details to the minimum, presenting them as small italicized snippets between Scorsese’s talks, hence removing any hindrance for us to speak with Scorsese the man and Scorsese the director. Though compiled from a set of lectures and interviews the director had given around the world, Scorsese on Scorsese never gives you the feel of an authoritative person directing you towards what you have to know. Instead, Scorsese recollects events, almost from the top of his mind, lets us interpret and thus get to know the man and his films more. Divided into six chapters, the first of which details his childhood and teenage memories and the rest taking us virtually through the making of each one of his movies, Scorsese on Scorsese is a joy ride for any film buff. There is much humour throughout the book and at times you almost hear Scorsese break out with his characteristic and infectious laughter. Many would agree if I say that Scorsese is one of the biggest film buffs of the world and this opinion is established as a fact in these texts. There is almost no line in the book where you don’t hear the man come up with a movie comparison or a simile that is related to the movies. Even in the most commonplace of statements, like feeling sick on the sets (“…I was coughing on the floor and sounding like a character from The Magic Mountain”), recalling parking problems (“…but destroying things as in a Godzilla movie”) or describing the streets of New York during summer nights (…reminds me of the scene in The Ten Commandments, portraying the killing of the first born, where a cloud of green smoke seeps along the palace floor…), Scorsese’s never flagging enthusiasm for the cinema surfaces. Scorsese on Scorsese is a must-read for anyone who doubts Scorsese’s status as a genuine auteur. As one moves along in the book, one sees that all of Scorsese’s characters have a bit of Scorsese in them and could be seen as extensions of his personality in a fictional world (Be the screenplay officially by Schrader, Price or Minion, Scorsese invariably seems to have had a hand in their final versions). Although the book covers the directors career only till New York Stories (1989), one can see the same phenomenon carry on in his later films too. As Scorsese goes on explaining how each movie, each scene and each set piece came about one can actually see the deep influence that his childhood and teenage has had on his thought process and his vision of the world. He elaborates on what made him take to priesthood and then the transition to cinema (He says: “In my neighbourhood, the people in power were the tough guys on the street, and the Church. The organized crime figures would tip their hats to a priest and watch their language, an they would have their cars and pets blessed”). This book was compiled just after The Last Temptation of Christ (1988) hit the screens and it is evident that the whole book centers itself on this event. Right from the unusual introduction chapter, which recounts the events that preceded the release of the controversial movie, one can see that the authors intend to take a look back at the director’s career standing at this historical point. 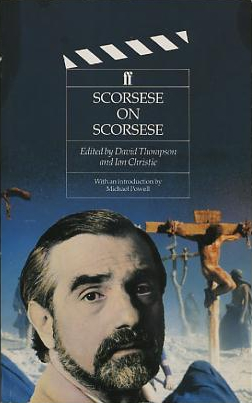 The concept of religion is also manifest in Scorsese’s talks throughout the book as he subtly reveals how his experience during the days as a young priest, away from the meanness of the streets, shows itself in almost all his early films. Be it overt as in Mean Streets (1973) or underneath as in Taxi Driver (1976), the idea of God and religion, Catholicism in specific, seems to be always present, mostly in the form of a hope for redemption, in his movies. In hindsight, The Last Temptation of Christ almost looks like a confrontation of sorts with his own inability to reconcile between what he learnt in the Church and what he saw in the streets. Another interesting thing is that even though he has had to put up with a lot, Scorsese never dwells on the difficulties much. Yes, he does talk about them in detail, but he makes all his travails sound like simple trivia and things of distant past. It is remarkable how he has earned the title of a major Hollywood director (in spite of his legendary association with New York), especially after his near ostracism by the studios after The King of Comedy (1982). He makes the trouble he had shooting After Hours (1985) and The Color of Money (1983) sound so amusing that one tends to overlook how appallingly tough it must have all been. The book complements these accounts with loads of rare, behind-the-scenes photographs from his movies, the complete story board of the final scene in Taxi Driver drawn by the director himself and other stills from famous movies, including the ones he cites as inspirations, placed side by side as if the director himself is showing us what went through his mind when he made those compositions. There is even a still of Michael Jackson and Martin Scorsese in discussion during the shoot of Bad (1986)! During the course of all this recollection, Scorsese talks about some abandoned scripts and some ideas for future that now seem so fascinating. He talks about a script called “Gangs of New York” that couldn’t be realized (and which eventually got made in 2002 perhaps with much change), he mentions that he doesn’t really want to do remakes (he made Cape Fear (1991) almost immediately!) and that he was immensely influenced by the music in the Moroccan film Transes (1981) (which has now got restored by the World Cinema Foundation headed by him and shown online for free!). Those who still think that Scorsese has sold his soul to Hollywood of late, I think, would see that The Aviator (2004) is as personal a movie as Taxi Driver or Raging Bull (1980) once they read this book, or rather this memorable evening of reminiscing with Scorsese. At the end of it all, it feels like if Scorsese had indeed taken up priesthood as a profession, which seems to have seemed very likely, the world would have got one good priest more but one great director less. Now, what kind of an unfair exchange is that! The first Martin Scorsese film that I saw – or that saw me – was Alice Doesn’t Live Here Anymore. The actors were directed with assurance. There was not a frame wasted. I said to myself: Michael Powell, you’re going to have a good time – this man knows where he’s going and you’re going with him. On the screen we were entering a fast food emporium, with two splendid actresses volleying words and phrases at one another. It was like watching a singles match on centre court at Wimbledon, between two champions. I hadn’t seen match play like this since I saw Pat and Mike. ‘That’s Scorsese.’ Said my friend, who had arranged the screening. He arranged a screening of Mean Streets. It was in a little projection theatre off Wardour Street, London WI. There were four of us and the projectionist. When the screening ended, we looked at each other, stunned. The five of us crossed a narrow street and went into a pub that was just on the verge of closing. Nobody else was there. Still we said nothing. There was nothing to say. All art is one, and every artist owes a duty to his art. We can’t all be masters, but we can know a master when we see him, because he has something to say to us, and sooner or later imparts it. The difference between these films of Martin Scorsese’s is that with Alice and Taxi Driver he handles the materials like a master; with Mean Streets he is in direct contact with the audience, from the beginning to the end. This is the rarest gift given to a movie director. Most directors, however wise, however experienced, however resourceful, however bold, don’t have it and never will have it. Marty always had it. He has this great, generous gift of creating a situation for an audience, and sharing it with them. He is the ventriloquist and his doll, the singer and the song. In his latest film, Life Lessons, Marty performs the same miracle, he is the painter and his palette, he is the pupil and the master, he is the cunning of the fox and the innocence of the child, he is the voice of the tape deck screaming ‘A Whiter Shade of Pale’. That he should weep for her? he is asking the same question that we ask of ourselves when Scorsese, in The Last Temptation of Christ, gives us our first glimpse of that hill called Golgotha. For, as the tears spring to our eyes, we know that we shall see that hill again, and then it will be our last sight on earth – and his. Seems to be a very interesting and engrossing book. More so since I’m not one of those who doubt Scorsese’s greatness. Its always nice to know those intimate and personal beliefs, opinions and tidbits of a master filmmaker like him. And yes, the foreword too was wonderful! Thanks a million for that tip Omar! I’ve seen Schickel’s documentary, also, titled Scorsese on Scorsese and found it to be just average. Will see this one for sure. Thanks. Nice review of a book I’d never heard of before, but now immediately want to read. The more so because I seem to be on another one of my periodic Scorsese kicks at the moment.